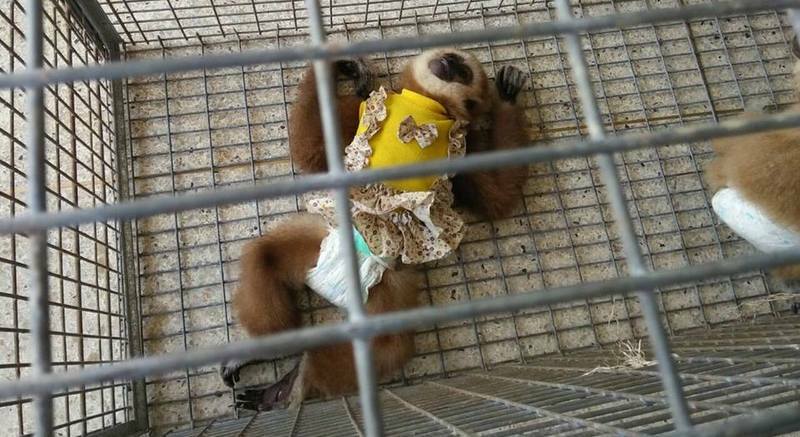 KRABI: An officer at the Department of National Parks, Wildlife and Plant Conservation has voiced his concerns about the illegal baby gibbon trade after three touts were arrested on Phi Phi Island for charging tourists for photographs with baby specimens of the much-loved mammals. Police arrested Chaiyarak Nilsamuk, 20; Anotcha Bangsai, 21; and Abdulvaris Imeusa, 21, in front of a resort on Ton Sai Bay on Sunday (Oct 11). The trio were found in possession of three young gibbons: two females, 9 months and 12 months old; and one male, 17 months old. They were charging tourists B200 per photo taken with one of the animals. Suwat Suksiri, chief of the DNP’S Krabi Office for “Non-hunting Areas” told The Phuket News that the three arrests is only the tip of the iceberg. “I believe that there are 50 more illegal gibbons on Phi Phi Island,” he said. Mr Suwat also believes that illegal gibbon touts are on the move. “There are far fewer in Phuket because of the ongoing crackdown against these touts, but there numbers are growing on Phi Phi and Samui,” he added. In Mr Suwat’s opinion, the profits to be made from illegal gibbons remains the largest obstacle to stemming the illegal trade. “A gibbon can earn a lot of money each month, up to about B100,00 during a single tourism high season,” he said. “A baby gibbon costs only B30,000 – most of the ones we know of are from Ranong province – but a tout will be fined only B1,500 for illegal possession of a protected animal. “I wish this kind of business would disappear. It’s cruel, and it’s not good for our tourism image,” Mr Suwat said. Is that really the best environment the caretakers can provide? A bare steel grid to lie on? Probably had decent bedding with the tout. Why not license this activity and make sure the gibbons are cared for because it's apparent tourists really love interacting with them. And how is it different from the tiger or elephant attractions (and soon the dolphins..)? What kind of penalty do those guys get? and what happen to this poor animals?